Sorry today's post is a little later than usual - I have been very busy this morning! We have been sharing our 'book-wealth'. As you are probably aware wee often get sent books from publishers and I also buy lots and lots of books. And as you can imagine we don't have space to keep them all. So one of the things that I am determined to do is to share our 'book-wealth'. 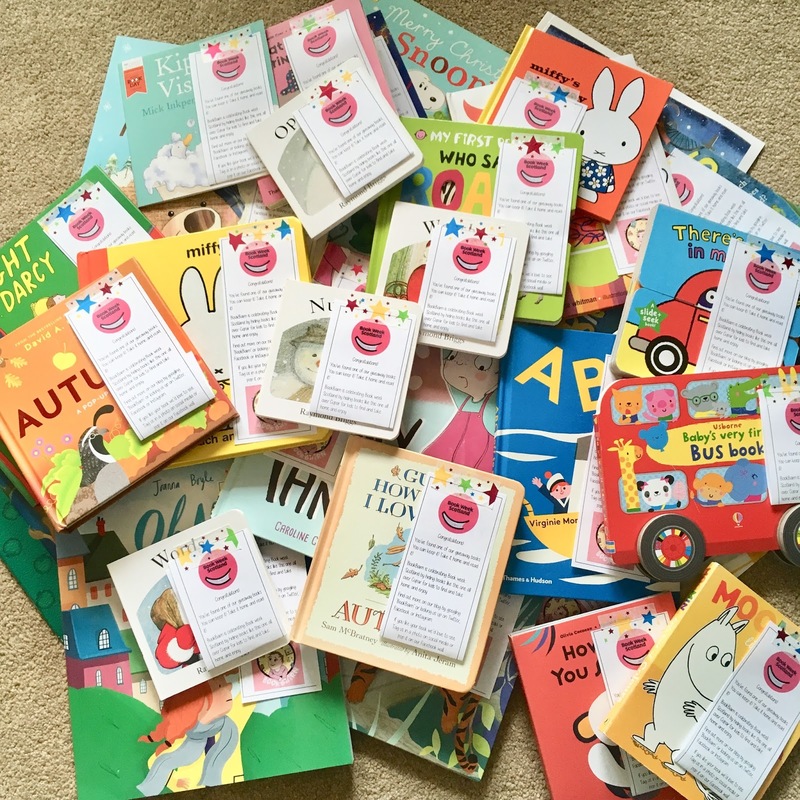 Earlier this month I gave over 100 of our book excess to a local charity, the Toy Drive, who give Christmas bundles of gifts and food hampers to local children and families who have had a referral from schools, social work and health professionals ensuring that these families have a stocking full of gifts on Christmas morning. I am proud that we have been able to contribute in our small way. But we were then left with several dozen books that I felt were too read to be called 'new' which is one of the criteria for the Toy Drive. So I thought back to International Book Giving Day when we created a book treasure hunt in our local play parks. Hoping for a dry and sunny day in November during Book Week Scotland I thought we could repeat the fun. And we have been very lucky as today was a bitterly cold, dry and sunny day! 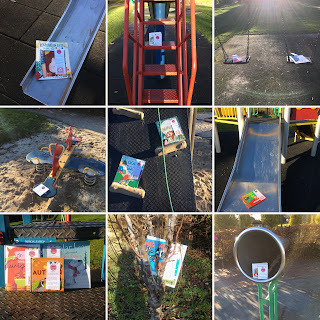 So we went to three local parks (and a very lovely bookish friend went to a fourth) to 'hide' some of our book wealth for local children to find. I just hope they all get picked up! We didn't need to worry as we arrived at one of the parks, near a duck pond and woodland, just at the time Forest Kindergarten was finishing so those books were gone before we were finished feeding the ducks. 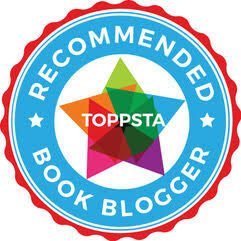 I got a lovely message from a mum whose daughter had had a bump and said that finding the book cheered her right up! This is all I could ask for! We then popped along to the 'big park' and BookBairn was really delighted to hide the books here! She ran from the buggy to all different parts of the park dropping off the books. A few people popped over to say hello and thank you which made it all worthwhile. As it got a bit cold we dashed up to the last park in the car and I nipped out to drop off the books myself! We really had a wonderful morning and have been sent a few photos of people finding our books. I hope you enjoy your new stories! We will definitely be doing this again in the future! Thanks! It's good to share! Looks like you had a great day. Sorry I couldn’t help this year. Aaachoooo!!! We did! We forgive you! And glad you are better!